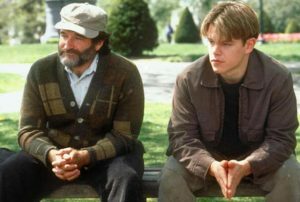 Over the weekend I watched Good Will Hunting, without doubt my favourite movie. I must have watched it well over a hundred times at this stage. The movie which earned two Oscars, Best Original Screenplay for writers Matt Damon and Ben Affleck, and Best Supporting Actor for Robin Williams, follows the personal struggle of the troubled boy genius from South Boston, “Southie”, Will Hunting (played by Matt Damon). It is a masterpiece, so brilliantly written that it really makes you think about all facets of life and the choices we make, from education, the job we take, friendship, and love. The turning point in Will’s life is the introduction to Dr. Sean Maguire (played by Robin Williams), a psychologist, turned teacher, who helps him to break down the barriers caused by his past – a tough life, much of which was in state care and correctional facilities – and to embrace the future rather than focusing on what might go wrong, a defence mechanism which holds Will back from developing relationships and fulfilling his potential. There is a great scene (see link) in Sean’s office when during a therapy session he questions Will on what he really wants from life, challenging him to move beyond the safety net of his Southie friends. “You are always afraid to take the first step, because all you see is every negative thing 10 miles down the road”, Sean says to Will. “What do you wanna do?” he asks bluntly. “You can do anything you want, you are bound by nothing…what are you passionate about? What do you want?” The scene ends with Will storming out; for all his genius he is unable, or too fearful, to answer the question. Of course, the reality is that even without the troubled past, the question “What do you want?” is extremely difficult to answer. Be it relationships (I’m aware actor Ryan Gosling owns the question in the Notebook, a tearjerker if you like your chick flicks), career, or more broadly what people choose to do with their lives, the natural tendency is to just float along. People either find it hard to know what they want or are too afraid to go for what they want. When I say people, I am not excluding myself, I am guilty at times too. It is fair to say that the growth of the self-help industry has been driven by the promise of helping people define and achieve what they want. Now, while I can’t help you figure out what you want to do with your life, it struck me that the question “What do you want?” is just as relevant when it comes to investments and planning for retirement. Ask this question of most people and the answer will be ‘the highest return with the least amount of risk’. However, this answer fails to address the heart of the question. As financial advisers our role is to help people move beyond the abstract and develop concrete goals, in order to better define the level of wealth required and when it is needed to meet those goals. Putting your goals down on paper can be a reflective exercise in itself. However, even for those who have a clear picture of what their goals are, the step of defining the wealth needed to make those goals possible can sometimes be a rude awakening, either save more, work longer or set more realistic goals. Still, a shock 15 years before retirement is much preferable to one five years before retirement, when many people only start to think more seriously about their financial plan. Inevitably, the discussion moves back to investments and the returns needed to achieve those goals but the difference being that you have a framework to align appropriate investment options to your respective goals. The framework I have found most useful is one I picked up in the early days of my career as a Financial Adviser with Merrill Lynch. Ashvin Chhabra, previously Chief Investment Officer of Merrill Lynch Wealth Management, now President of Euclidean Capital, developed the “Wealth Allocation Framework”. Chhabra’s Wealth Allocation Framework considers an investor’s total wealth – financial assets and liabilities, and human capital (future earnings power) – and reconciles their desire for safety to protect their basis standard of living, with the desire to increase their accumulated wealth in a material way, what he calls aspirational goals. 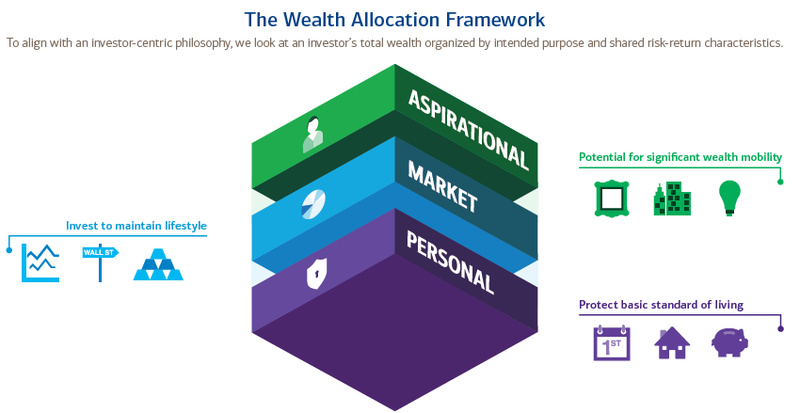 The Wealth Allocation Framework is defined by three categories, Personal, Market and Aspirational, each with “specific types of risk that contribute to the possibility that an investor won’t achieve his or her goals”. Aspirational: Provide an opportunity to increase his or her wealth substantially. This involves taking on some idiosyncratic risk, like a business, or small group of assets with a risk of substantial loss of capital. For example, a concentrated equity position in one company. Anyone who has gone through the process of developing a financial plan will be familiar with the basic idea of a personal balance sheet, similar to what a company does, just tailored to an individual or family. “This is the balance sheet, reimagined through the Wealth Allocation Framework with the focus on an investor’s priorities and goals. It becomes a snapshot for evaluation and a starting place for building a goals-based financial strategy, with resources and risk aligned to what an investor wants to achieve”, according to Chhabra. Above all, taking a more comprehensive view of wealth and goals when devising an investment strategy, investors are much less influenced by short term market noise. Of course, a financial plan is not static, it is a dynamic process that requires regular reviews, but done right can help investors avoid the knee jerk decisions which sabotage the achievement of their all-important long term goals. Finally, in setting your personal financial plan, do not make the mistake that most people do, and ignore what may be your greatest asset of all, human capital. Where financial capital is your accumulated monetary and physical assets minus liabilities, human capital is effectively your future earnings power. For many people, increasing the value of your human capital – through education, personal development, travel etc. – will be far more lucrative long term than fretting about whether the equity markets were up or down last quarter. As for Will Hunting, he chose the girl over the high paying job and followed her to California. I did the same once for a girl, quitting my job with Merrill Lynch in America’s finest city, San Diego, to come back to Ireland. While it didn’t work out, I have no regrets. I would do it again. Life is about taking risks for what you want, and just as is also the case when it comes to investments, there are no certainties. Still, those 325 days a year of San Diego sunshine would be nice! Good luck figuring out what you want.